Working in North America I've heard it countless times: "Can you really ski in Australia?" My answer is always "Yes, but it's not like here". If I'm being queried by a British tourist I usually try to slip in a comment about how I'd rather ski on slushy snow with rocks poking through than on one of those dry slopes (Hey! We've got some great skiing in the Scottish Highlands don't you know! - Ed). Australia has such a big reputation for its beaches and the outback, that people simply overlook the possibility that snow could fall there. There are actually 9 functioning ski resorts in south eastern Australia with more to offer than you may think. The Australian Alps are the highest part of the Great Dividing Range, the largest mountain range in country. These Alps border the states of New South Wales and Victoria, where peaks climb as high as 2,000 metres (6,500 feet). Some of the higher peaks emerge above the tree line and there has been evidence of glacier activity around Australia's highest peak, Mt Kosciuszko (2,228 metres; 7,310 ft). Snowfall in Australia has been a much discussed topic over recent years. The 2007 season had an excellent start and was well appreciated by the Australian ski community, 2006 recorded the lowest snowfall in 40 years2. Given Australia's ski resorts' proximity to each other, they all experience similar weather. Rain can come with strong wind, enough to close a resort for days and erode the snow base significantly. But Australia does also have a reputation for blue bird days. Slushy, sunny days are frequent and it can give the feel of endless spring conditions. Extensive cold and stormy periods don't seem to happen as much as they used to, but if the temperature stays low after a snowfall it can be just as fun to ski as anywhere else in the world. 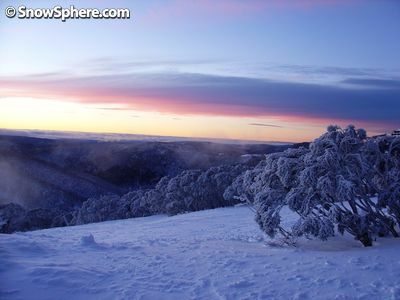 Snow making is a very busy industry in Australia with millions of dollars being invested by resorts every year. Recently the weather has become more unreliable, requiring the snow making infrastructure to be expanded and improved. Mt Hotham announced last year a sustainable strategy for its snow making reservoirs by treating waste water, an initiative welcomed by the Australian public (Australia has been experiencing severe drought over the last 5 years). During lean snowfall years resorts have to rely mostly on artificial snow to stay open. By the time September rolls around, the Aussie spring arrives with temperatures over 20°C, causing the snow to recede very quickly. This time of year it's common to see dump trucks full of snow running up and down the alpine roads, dropping the precious cargo in front of the ski school learning areas. All the talk of Australia's ski resorts being the first to disappear with the world's rising thermostat may have some truth to it, but snow in south eastern Australia can still surprise. It may be inconsistent, but powder days are still common throughout a typical season. Skiing through the low-lying branches of the snow gums offers a different level of tree skiing as opposed to picking a line through the North American conifers. There is some alpine terrain in the resorts but the majority of ski runs are at or below the tree line. Backcountry lines are accessible but most descents require a rigorous hike out to get back to the resort or the road. 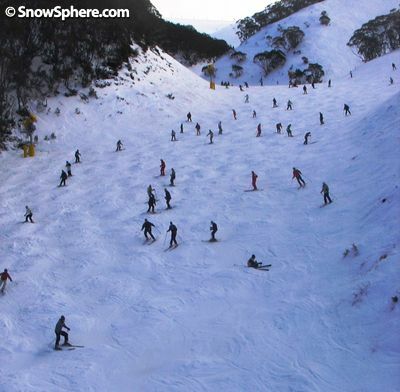 You can find steeps in the resorts; the Extreme Skiing Zone at Mt Hotham and Funnel Web at Thredbo are examples of true expert terrain. Powder days can be epic and leg-burner bump runs are quick to form afterwards. Intermediate cruiser slopes are great early in the day but can get quite crowded and bordering on dangerous during busy periods. Few foreigners come to Australia for ski holidays, but overseas workers in the resorts are not hard to find. Adrian Seligman is a local to Sunshine Village Resort in Canada. He worked in Mount Hotham Ski School in the winter of 2007 and is keen to return for another season. "The Aussie Ski Experience was first class. I really had this impression of skiing tiny little hills on a few centimetres of snow. But working at Hotham during one of their better seasons along with some really fun and challenging terrain made the whole ride great." New school culture has taken off in Australia with most resorts featuring terrain parks and rail/jib gardens. Young Australian skiers are embracing the shift from traditional freestyle mogul and aerial skiing and joining their snowboarder friends in the terrain parks. Australia has recently produced world class free-style riders such as snowboarder Torah Bright (Roxy) and skier Anna Segal (K2). While the Aussie resorts may not be on the scale of other world-class ski areas, the price of daily lift tickets is surprisingly high. In the 2007 Australian Alpine Club Newsletter, five Australian resorts were listed with daily lift ticket prices more expensive than Canada's Whistler Blackcomb! A full day lift pass at Perisher Blue Resort costs $95 AUD (US$90/£46). The Australian Alpine Club has stated that "international competition for the Australian snow sports dollar is a reality". Indeed the Australian ski market is broadening its horizons, with many crossing over to New Zealand on a similar budget or saving up for the flight and skiing in Japan or Canada. The national parks that contain most of Australia's ski resorts have a rich history. As early as 1843, white settlers began to explore the region, cutting trails through the heavily forested hills. Cattlemen, gold miners and bushrangers followed and have all contributed to the heritage of Australia's High Country. The drive from Melbourne along the Hume Highway takes you through the region of one of Australia's most celebrated icons, a bushranger named Ned Kelly. This outlaw made his name as Australia's most notorious outlaw in the late 1800s. The site of his last stand, located in the small town of Glenrowan, is a popular tourist attraction. The majority of tourists in Australian ski resorts either Australian, or foreingers living here. Locals often refer to these holiday-goers as 'punters'. Few are above the intermediate level of skiing or snowboarding, yet many refuse to pay for lessons in the hope that they can learn by trial and error or from their friends. Actions that would get you banned from an American ski resort seem more acceptable in Australia, such as skiing out of control into slow zones and ignoring a persons' right of way on the slope. Despite all the obvious shortcomings of the punter crowd, they are able to have the time of their lives on their holiday. Seeing a family sporting hand-me-down retro outfits, rear entry boots and old hockey helmets is a unique sight and the pinnacle of 'Australiana'. Fashionable ski wear and the latest equipment is not important - only family, friends and having fun. You'll see them out skiing in the rain until the last chair, determined to get the most out of their snow experience. The bars are alive with families every afternoon and the younger crowd party long into the night. At first glance the thought of working in one of Australia's ski resorts may sound quite arduous. Long hours, cramped accommodation and inclement weather are just a few of the nuances that one needs to come to grips with working in the Australian ski industry. But there is something about these towns that draws people back year after year. Being smaller than most North American or European ski communities, locals and seasonal workers develop a kinship that really isn't seen elsewhere. Most of this kinship is of course developed through spending time at the pub, or talking about what happened at the pub the previous night. Working and living in extremely close quarters to the rest of the town is challenging at first, but once you have experienced it you can find yourself with some of the closest friends you have ever had. You may not meet as many people as you would in Whistler or Aspen, but the relationships you develop can be much more intimate and easily as memorable. Foreign workers in the Aussie resorts are all about the travelling. 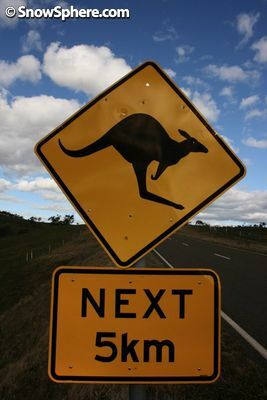 Most take some vacation time after the season is done to enjoy Australia's other attractions. Surfing road trips along the coasts are a big hit, as is backpacking through some of the hundreds of beach towns along Australia's east coast. The spring time is warm and the beaches are spectacular, and it's a perfect finish to a winter in the Australian ski hills. 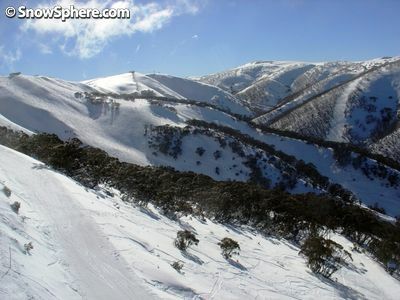 So if you're after an adventure and not afraid of long haul flights or paranoid customs officers, try skiing down under. If it's a good year you'll love the snow and if not, the partying is guaranteed to ensure you still have the time of your life. Vince Shuley is an Australian ski instructor who lives and works in Whistler, Canada. He shares his time between teaching skiing, travelling and exploring various ski destinations around the world.